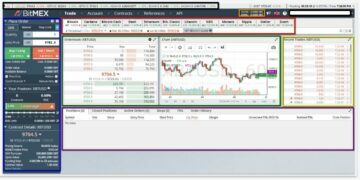 BitMex.com is the place to be if you want to have a website that provides digital currency exchange services with leverage. Here people will be able to do margin trading through their provided features from their selection of crypto markets. Users will be able to trade BTC against USD, and other cryptocurrencies like ADA, BCH, DASH, ETH, ETC, LTC, NEO, XMR, XRP, XLM, and ZEC. What’s even better is that the website also offers a demo account for people that want to explore the world of crypto trading without spending any money at all! All they need to do is to create a separate demo account and start experimenting with the available markets. Without further delay, let’s dig into their website and familiarize the buttons and important tabs. We have color-coded the important areas of the platform for easier reference. Black – Located at the topmost part of the exchange platform is the market overview. Clicking your mouse on the digits will give you data on the selected market showing you the gains and losses with just a few clicks of the button. Blue – The left-hand side panel is the order slip and which contains all the details of the trade that you will be making. 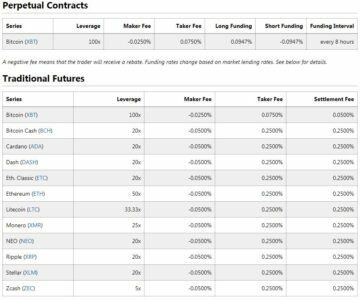 The lower part of the panel also includes the market contract details where the trader will see the index price, open value, and funding rate to name a couple. Red – The market selection area is where you will be able to change from the different available markets on the website. Simply click on the market that you want to trade at and this will automatically show you the relevant charts and numbers. Green – This is where you will be able to see the charts in the selected market. Aside from the selected market chart, traders will also be able to use this area to view the order book where recent orders are being listed. Purple – On the lower part of the exchange platform is where you see the current positions, active orders, and your order history. This is perfect for keeping track on your latest actions made on the exchange platform. Yellow – Recent trades will be shown on this panel. For a seasoned trader, this is one way of telling the most updated price of the market and can be used for predicting dips. The Gold box on the upper right-hand side of the exchange platform shows the available balance of the account that has been logged in. Please be advised that this will always show the current balance in Bitcoin and not USD or any Fiat currency. In addition, for all our non-English speaking traders will be able to change the language from English to Chinese, Russian, Korean, and Japanese. Now that we’ve familiarized ourselves with the exchange platform, are you ready to trade? Trading on a margin is basically borrowing money from a broker to place an order. It is a direct loan from the website that you want to trade at. The leverage provided by margin trading enables you to buy more than what you actually have. Bitmex.com offers up to 100x leverage for BTC and goes up to 33.3x for other available coins. Here, aside from BTC the website also supports ADA, BCH, DASH, ETH, LTC, NEO, XMR, XRP, XLM, and ZEC. 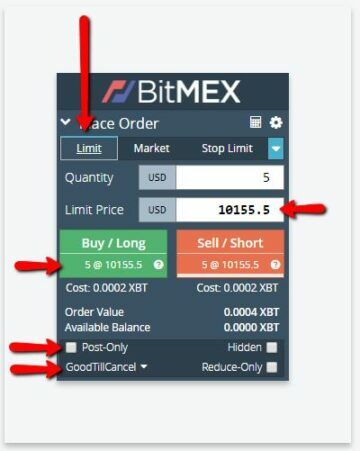 Now that we’ve got that out of the way, we will be showing you how to trade here at Bitmex.com. And as we go through all the trade processes we will discuss important inputs and explain the whole process too. 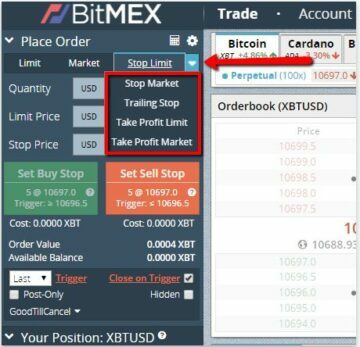 There are different types of order tabs that you will be able going to choose from here at Bitmex.com. Knowing which tab is best for your transaction is as important as knowing if you’re going to make a profit out of the trade or not. Limit – The most common order type on the website is the Limit order. The reason for its popularity is the straightforward approach on how to buy and sell. Market – The market tab is your one-button to buy or sell for the current price. When using the Market tab, all you need to do is make sure that you double check everything since latency plays a big role in updating the website’s current price on the chosen crypto. 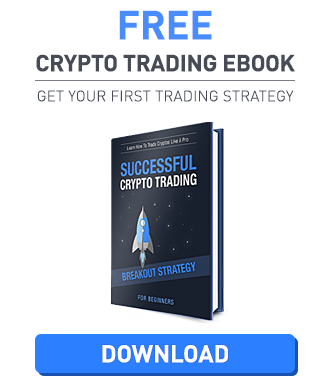 Stop Limit –To get a rough idea of how the stop limit works the system lets you enter any amount of the limit price and stop price of the current market. The order will be placed at a specific price you entered or better after the provided stop price has been reached. At the moment the stop price is reached, the order will push through to buy or sell at the limit price or for a better one. The default page that you will be looking at right after you logged in would be under the Limit Order tab. This tab allows you to place an order may it be Long/Short (Buy/Sell) at your desired price. Shown in the screenshot above is a sample of a Limit Order for 5 contracts. The Limit Price is the price that you want to buy or sell it. For our sample, the limit price is 10155.5 per contract and we’ve got five contracts listed shown under the Quantity box. Now if we click on the submit button on either buy/sell we will be moving our position to plus 5 or minus 5 contracts depending on which option we choose to take. If you hover your mouse over these commands, you will also be provided with your estimated liquidation price after the execution. The “Post-Only” box will not execute immediately against the market and is used to ensure the maker of a rebate. If the order will execute against resting orders, it will cancel the whole order instead. The “GoodTillCancel” box shows the default selection which is “GoodTillCancel”, meaning the order will push through until you cancel it manually. It can also be set to “ImmediateOrCancel” which will set the unfulfilled portion to cancel immediately after the order has been placed. The last setting is called “FillOrKill” where the order will be pushed through if the exact quantity can be filled. The Market Order is pretty straightforward since the system will do all the work for you and find the best available price. This tab also includes the same features that the Limit order has, the only difference is that you are unable to manually choose the price since you are letting the system work by itself. Unlike the regular orders that we’ve already talked about above; stop orders do not appear immediately when you log into your account if you do not click on the tab selection itself. The difference is that stop orders are being triggered by a stop price. Stop Market Order is an order that is pushed through when your stop price is hit. For example, if the price of BTC is at 16,000 and you want to purchase it for a lower price at 15,000 (which is shown on the screenshot) then the system will wait for the price to drop down until 15k before the order is triggered and pushed through. 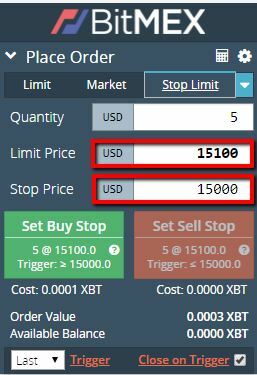 Stop Limit Order similarly works the same as the Stop Market order that we’ve talked about earlier with the additional “Limit Price” tab wherein you will be able to adjust manually as well. 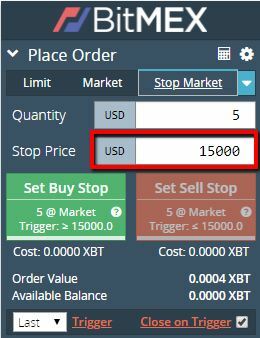 The sample screenshot we’ve got the stop price at 15000 and limit price set at 15100. So what happens is that the system will wait for the price to reach 15000 before the order will be pushed through but the limit price is set as a safety that you will not pay more than 15100. Trailing Stop Order works with a trail value instead of a limit to determine when the order will be pushed through. Shown in the screenshot above the trail value is set to $10. For example, we have placed the position when the price for BTC was at $60 and trail value at $10. When the value of BTC will go down to $50 the order will be pushed through. Taking profit orders allows the trader to set a target price on a live position and close it to take the profit. Taking profit orders can be done through a market order or limit order. 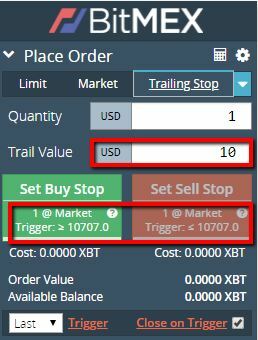 This feature can be used to set a target price for a position, it works just like a stop but triggers are being set in the opposite direction. When an order is confirmed, this will show up on the bottom part of the platform. The sample screenshot shows the active orders that have been filled and is waiting to be pushed through. An order can be canceled by clicking “Cancel” on the appropriate order that you want to be canceled from the active list. In addition, when an order is fulfilled this will light up and show on the bottom of the platform; just like the sample screenshot below. If you feel like you’re not that confident yet, it would be best to try out their test trade website wherein you will be able to try every step shown on this guide and go through every feature yourself to give you a hands-on experience. You do need to create a separate account for the test platform but that would not take you more than three minutes to complete! Please click this link to be redirected to the test platform website. The website does not charge any deposit or withdrawal fees. The charges that are set are for the BTC network fee and is used by the blockchain. You can read more about their fees in their websites. Before you start trading, you need to be familiar with what you are getting yourself into. If you want to pursue margin trading then you need to make sure that you know the basics and the difference between a margin trader account and a cash account. Cash accounts are accounts wherein you get the actual funds deposited reflecting on your account and you are unable to trade more than what you have. Margin accounts are not FREEBIES that you use for free! A margin is in the simplest way a “loan” given to you by the trading website. Of course, loans need to be paid back with interest; and this will depend from one website to another. Creating an account with leverage is the expansion of funds from a small amount to a much bigger one creating more opportunities for you to take. But this does not mean that you will be using the leverage service without any fees at all. Since you will be paying fees on top of the funds that you are going to use, the margin of investment and ROI should be considered. When you trade on margin, YOU CAN LOSE EVERYTHING IN A VERY SHORT TIMEFRAME! When you buy and sell coins on spot, you can “sit out” certain market cycles and corrections and you are not forced to sell. 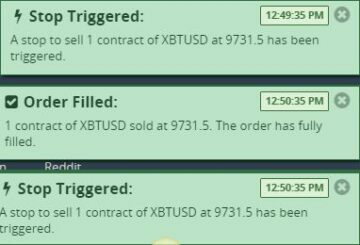 With margin trading – if you get stopped out, the whole amount you have put in that trade is lost, even when the price goes “in your direction” just 5 minutes later. Be aware of that, only trade with what you can afford to lose and train with very small amounts until you are ready to bet larger amounts on your trades.